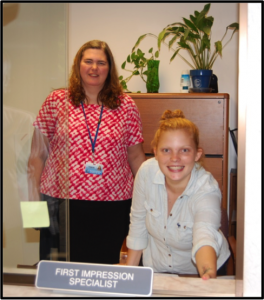 Hannah Richardson began her work experience with the Asheboro Goodwill Resource Center as a Receptionist Assistant on June 30, 2016. Before beginning her work experience, Hannah had a small amount of customer service skills, as well as communication and leadership skills. However, Hannah was motivated and eager to begin this opportunity and work experience with an organization she feels is dedicated and connected to the community. During Hannah’s work experience, she was also attending classes towards earning an Associate’s Degree from Randolph Community College in Medical Office Administration. Her goal was to utilize the office skills and training obtained from her curriculum while performing general office duties, assisting customers with computer questions and issues, and providing customer service that would enhance her future employment opportunities. Hannah was delighted to say she gained an enormous amount of skills during her work experience that she looks forward to transferring to future employment.